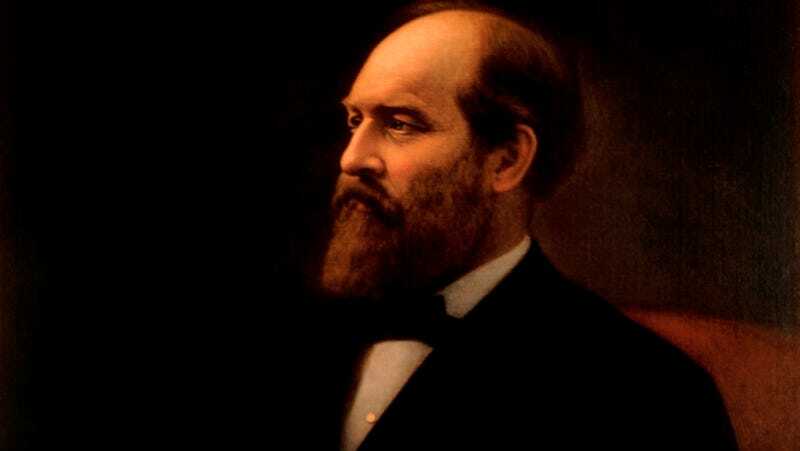 Before President Garfield went into politics, he wanted to become a mathematics professor. He had a lively interest in math, and studied even after he decided to run for Congress. One day, he was discussing mathematics with other members of the House of Representatives — and how great would it be if mathematics was still discussed for fun by members of Congress — he came up with a simple proof of the Pythagorean Theorem. Most will remember the Pythagorean Theotrem as the old A2 + B2 = C2 problem, wherein the square of the two sides of a right triangle, added together, will yield the square of the hypotenuse. Garfield’s proof is simple, but it takes a little fiddling with paper. Grab a piece of paper and cut two identical right triangles, trying to include one long side and one short side. 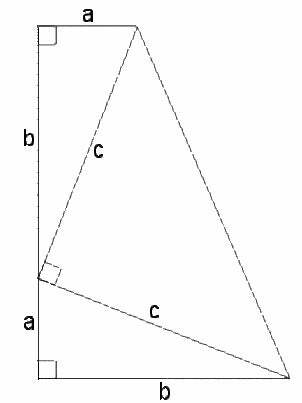 Call the long side A, the short side, B, and the hypotenuse C. Place them, opposing points together, on a piece of paper so that they look like this. Draw the third line in and you’ve made three triangles. The total area of a triangle can be calculated as one half the base times the height. Each of the original triangles has an area of ½ ab, and the third has an area of ½c2. A trapezoid has an area calculated by its height times one half the sum of its uneven sides. So the trapezoid has an area of ½ (a+b)(a +b). Since these areas are the same, this leads us to an equation. This simplifies quickly. On the left, the two halves of 'ab' can be added together. On the right, we just multiply all the terms. Since we have 'ab' on either side, they cancel each other out. Well, you get that, and the deep satisfaction that you have solved a problem, Presidential-style. Via UGA, UGA, Curiouser, NMSU.